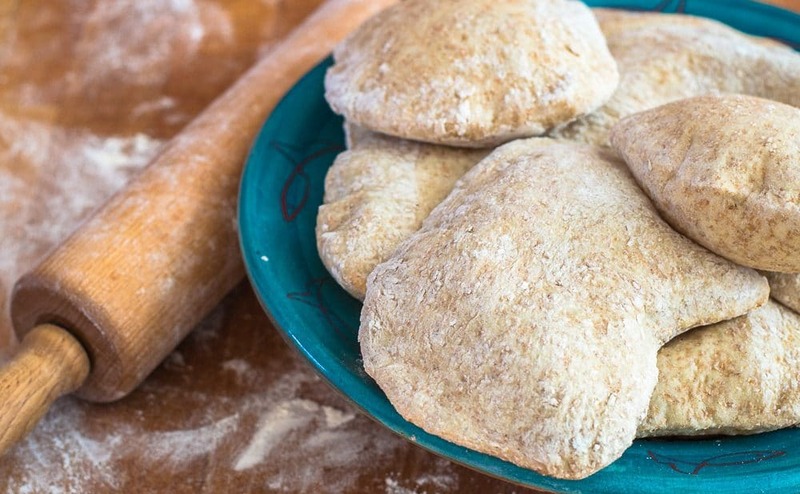 Homemade Wholewheat Pitta Pockets are surprisingly easy and quick to bake. It is almost magic to see them transforming in the oven from flat tires to light balloons. Pitta pockets are perfect containers for all kind of delicious food we like to have. I find them also very fun to use, child friendly. You just make a little hole on the side of the pitta with your finger, gently open the pocket, fill it with what you like on the table (at least two vegetables) and grab a bite! Or, just let your kids do that! 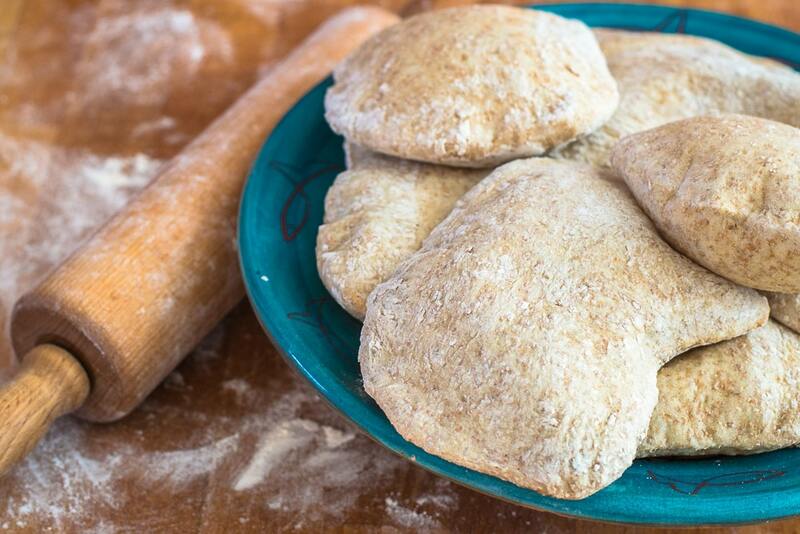 The secret of the homemade wholewheat pitta pockets is not really in the ingredients, but in the process. A simple basic bread recipe or pizza dough is fine to prepare them. I usually use the double of the dose below. I use half of the dough for the pittas, and the day after, with the other half, I make bread, pizza or sugar free fruity breadrolls. 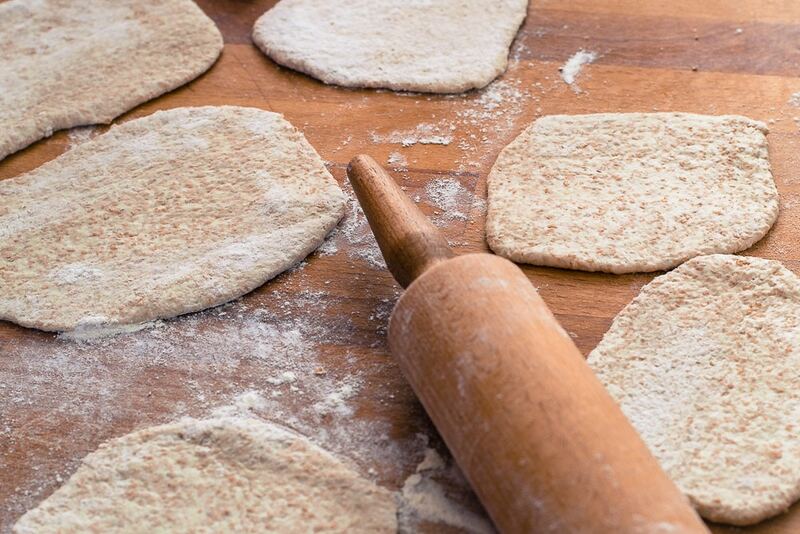 Or I simply place the dough in the fridge and I use it in the following 4 days for other pittas. That’s because once the oven and your tins are hot these amazing little balloons will be ready in few minutes and you will have freshly baked bread in no time. Mix all the ingredients together enough to form a nice ball and then knead it for 7 minutes. I know it may seem crazy but I never do the yeast with the water thing anymore! Anyway if that’s how you make your bread or your pizza dough go ahead and do it also now. Let it rest covered in a warm place. When it has raised it is ready to be used. Divide the dough in 11 balls. In the meantime heat the oven 220 C with two metal large tin inside. The tins must be very hot when you place the pittas on them. When the tins have been in the hot oven for about 5 minutes place the pittas on them and pop them in the oven. You will notice that they will start to rise and form bubbles almost immediately. They will be ready in less than 5 minutes. When the top has risen from the bottom to form a little balloon you can take them out of the oven. Open the pockets with a scissor or with the hands and fill them with your favorite filling. Or cut the pocket in two with a knife and have two little pockets! If you have any pitta leftover place it in an airtight bag and it will stay fresh for a couple of days. If you don’t want to use all the dough once it has raised you can cover the container with cling film and place it in the fridge. Anytime you want to have your freshly backed Pittas you can take a bit of the dough from the fridge. I have tried this method may times. I have seen people do this on u-tube and I can never get the pita’s to pop. I’m doing something wrong. Maybe it’s the white whole wheat flour I use? or the way I roll out the dough. I get them to pop by cooking them on top of the stove on a flat grill. I have used many dough recipes but, now I put olive oil, 6tbs, and a half a cup of gluten in the dough. What you are doing seems much easier, and quicker. The problem for me is, I live in an apartment in new york city . I don’t use my oven from mid may to about oct to not heat the place up so I try to be as inventive as I can using my stove top. I don’t think the problem is in the flour you use. The real trick is to be sure that the tray is piping hot before you place the pitta on it and then in the oven. No parchment and no oil on the tray. As soon as they start to pop up theY are ready. I totally understand the heat problem, because when I lived in Italy it was the same. Anyway the important thing is that you found your way of making pittas! And if you will try again in the oven when the weather will be cooler…let me know!